SharePoint 2013 introduces a Representational State Transfer (REST) service that is comparable to the existing SharePoint client object models. Now, developers can interact remotely with SharePoint data using any technology that supports REST web requests. This means that developers can do Create, Read, Update and Delete (CRUD) operations from their apps for SharePoint, solutions and client applications, using REST web technologies and standard Open Data Protocol (OData) syntax. SharePoint 2013 adds the ability for you to remotely interact with SharePoint sites using REST. You can interact directly with SharePoint objects by using any technology that supports standard REST capabilities. 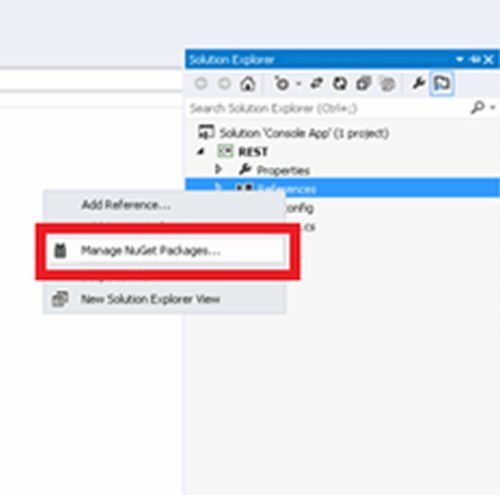 To access SharePoint resources using REST, construct a RESTful HTTP request, using the Open Data Protocol (OData) standard, that corresponds to the desired client object model API as in the following example. 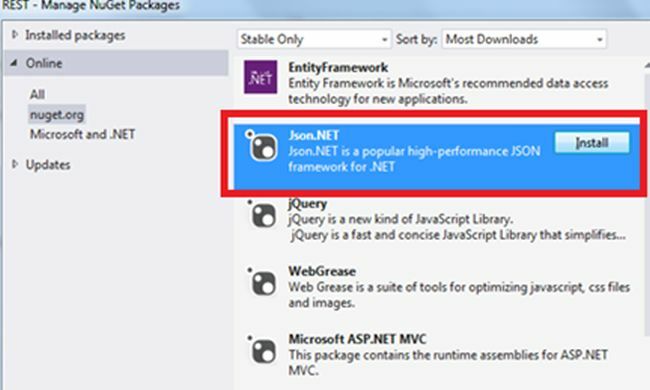 Select on Json.Net and click install. In this article, I am explaining two approaches for accessing a REST service, one using JSON.Net and the other method using XML.